Pete and Ramon gear up for another week in comics! Pete's got a spoiler-free review of Iron Fist, plus the first issue of Marvel's new on-going Iron Fist book. Dark Horse's newest Witcher book draws to a close, Pete and Ramon are at odds on the use of watercolors in comics, but topping out the list this week was Unworthy Thor - what did Nick Fury say to him that made the hammer drop from his hands?? We'll tell you! Just hit the play button! Tony Wolf drops by the Basement this week! He's got a new Greenpoint of View on the way in the next couple weeks, as well as a couple other projects he'll tell us about. The Inhumans are cast, the new Guardians of the Galaxy trailer has hit the airwaves, and Logan premieres in theaters. Meanwhile on the comics front, there were a few misses this week, and the boys'll be happy to tell you which you shouldn't swing your wallet at! But there were plenty of hits too, like rat Queens vol.2, Extremity, Savage Things, and plenty more! Long time friend of the basement Craig Rippon and his daugher Faith drop by to talk about their new documentary Black Ink! Greg's long-awaited return to the roundtable! Pete actually likes a book about clones and a book about Damian Wayne! Also, does the NBA even care about travelling anymore? Grab some scotch, grab a beer, and join the madness! Its Chris, Pete, and Pete at the roundtable today, and the Black Flash is the first thing on Pete's mind! A quick (pun intended) review of Legends of Tomorrow and Flash gives way to this week's comics, including indie hit Box Office Poison Color Comics by writer and artist Alex Robinson, and Planetoid Praxis, written and drawn by Ken Garing. Nailbiter hits its penultimate chapter, and Killer Frost turns over a new leaf. Rocket Scientist-Ninja Chris Craddock makes his Season 10 debut on the Pete's Basement Show! Justice League vs Suicide Squad concluded this week, and found a surprisingly receptive audience in Pete. Meanwhile, many years before Wonder Woman would emerge from clay, The Odyssey of the Amazons sees the girls of Themisyra taking on the frost giants of Nordic lore! Another hitman gets screwed over in Dante, and a town full of women find themselves suddenly in charge of the entire kingdom in Lady Castle! Dimitrios drops in for his 1st appearance in Season 10, with news of his new comic shop opening up! Anyone Comics in Crown Heights, Brooklyn will be opening in less than two months! And he's got plenty of giveaways for the Basement fans out there! His creator-owned Millennials 2 hits the stands and he's giving them to you -- as long as you can answer his trivia questions, that is! Meanwhile, God Country from Paybacks' Donny Cates and KaBOOM's The Deep took top marks this passed week. Amazing art and stories and the boys are raving about them! Justice League vs. It's the ALL-STAR beginning of SEASON 10! Pete is kicking it off in a haze of 18 year old whiskey and three weeks of books to review as we get back from Christmas and New Years. The crew reveals their Nerd-Christmas presents. Pete's hating on some of his usual favorites and liking books you wouldn't suspect. Does Trish hate Rogue One? And some special guests show up to usher in our forthcoming 'Best of 2016' video. Will Pete make it all the way through? Tune in and find out! 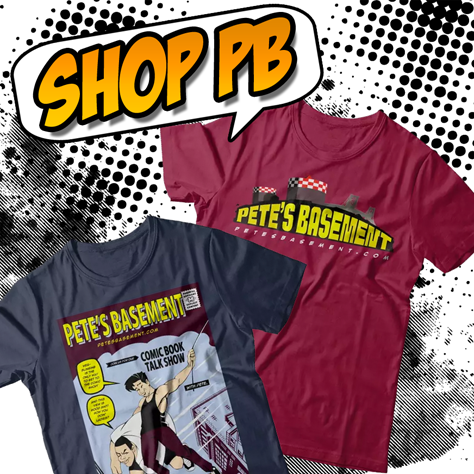 It's the last Pete's Basement episode of 2016! And Pete, Ramon, and Rich are here to take you out with a bang! Or at least a shot...come to think of it, more than a few shots. You know Pete. Who needs eggnog when you've got a good aged Scotch. Christmas bells ring loud in the Ghost Rider X-Mas Special Infinite Comic by Wu-Tang's own Method Man! Rockstar and Motor Crush, both from Image, round out the top picks for the week. What do the boys think of Inhumans versus X-Men? How are the Transformers doing since Revolution? And what's up with a McFarlane sketch cover?